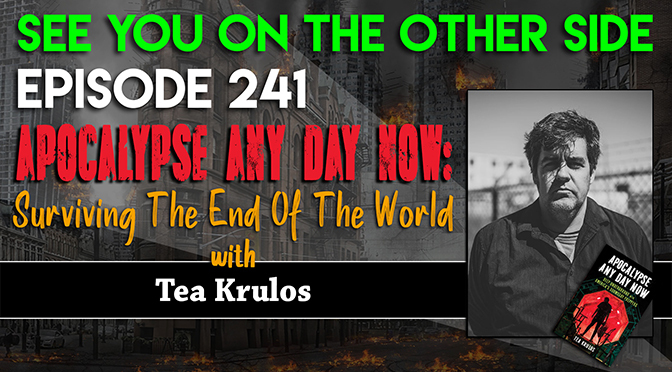 Last time we talked with author Tea Krulos, he was reminding us about the famed Doomsday Clock settling once again at the dangerous Two Minutes to Midnight. 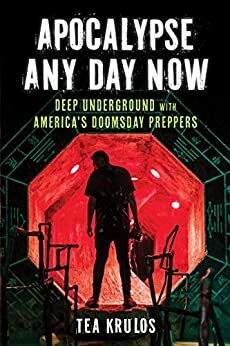 He was paying special attention to the clock, because it was directly related to his latest book, Apocalypse Any Day Now: Deep Underground with America’s Doomsday Preppers. And it seems like every generation believes that the end of the world is going to come in their lifetimes. In the New Testament Book of Revelation, Jesus even says “Behold, I come quickly: blessed is he that keepeth the sayings of the prophecy of this book.” The John who wrote Revelation (whether he was the Apostle John or a different Christian prophet) thought that “The End Is Near” almost two thousand years ago. And if God isn’t going to bring about the end, then humans will. Baby Boomers who grew up in the 1950s and 60s had Civil Defense drills where they hid under their desks in case of a nuclear attack. People were legitimately fearful of The Bomb and they were being trained in school on what to do if we were attacked. This is an ad from a Milwaukee company in the 1960s, and it’s just one of many. Doomsday Preppers in the Atomic Age weren’t as weird of a thing because the Soviets were putting missles in Cuba less than 100 miles from the American coast. Nikita Kruschev was banging his shoe on the table of the United Nations screaming “We will bury you.” The generation before was involved in the most devastating war in history and the world witnessed the Totalitarian Communist regimes in Asia and Eastern Europe murder millions of their own citizens. We can make jokes now, but in the Twentieth Century, we were about as close to a man-made apocalypse as you can be. CNN even made an TEOTWAWKI video in the 1980s, to be the last thing that they play on the air in the event of the apocalypse. It’s a military band playing “Nearer, My God, to Thee” which is a Christian hymn about Jacob building his ladder to Heaven. It’s also rumored to be the last song the band played on the deck of the Titanic as it was going down. So, while it’s easy to be dismissive of Doomsday Preppers as fearful or crazy, it’s also important to remember that every generation has its own scare. My scare was Y2K, Art Bell was talking about how the grid was going to go down almost every night running up to New Year’s Eve, it even was the theme of the first Family Guy episode! People believed that catastrophe was coming. Apocalypse Any Day Now treats preppers with a mix of compassion and bemusement. Yes, there are absolutely outlandish ideas out there and Tea isn’t afraid to tackle them, but people are whipped into a state of fear by institutions like the media and religion. Is it any wonder they might go out of their way to protect their family against the unthinkable? And it’s not just ultra-right reactionaries that are prepping for TEOTWAWKI, plenty of liberals have been told that Donald Trump is Hitler and he’s either going to start a nuclear war through bluster against other nuclear powers or just sheer ineptitude and he might press the wrong button. But also on the left side of the current culture war, there is also the fear of climate change. And through political polarization, we’ve turned a very real issue of the temperature changing dangerously to either a narrative of “we’re going to die tomorrow” or it’s all some kind of hoax so that the government can take more control over our lives. Where, as usual, the truth lies in the middle, a slow rise in temperatures over time will change our agriculture and force people to abandon sea level countries. And when you combine weather changes with overpopulation, societal conflict is bound to occur, whether it’s a refugee crisis or a food shortage, and it’s not going to happen overnight like The Rapture, it’s going to be a slow march towards the end of modern civilization. What is the Sixth Extinction? Can it be avoided? Is our only solution to escape the planet? Whatever happens, I just hope that we’ll grow gills like Kevin Costner in Waterworld. For the song this week, we thought about the wrath of God that people once thought was going to precipitate the end of the world. When that didn’t happen, it was going to be a nuclear holocaust, when that didn’t happen it was going to be Y2K, and now it’s going to be something else. Some people think humanity is too sick to go on and if the end of the world isn’t brought about by an outside force, they’ll rise up and do it. This song is about when you don’t get the justice you want from God, then you’re just going to take care of it yourself. Here’s Sunspot wth “Fire And Brimstone”. Vengeance is mine, he said. Just bide your time til Judgment Day. Is there any difference betwixt justice and revenge?